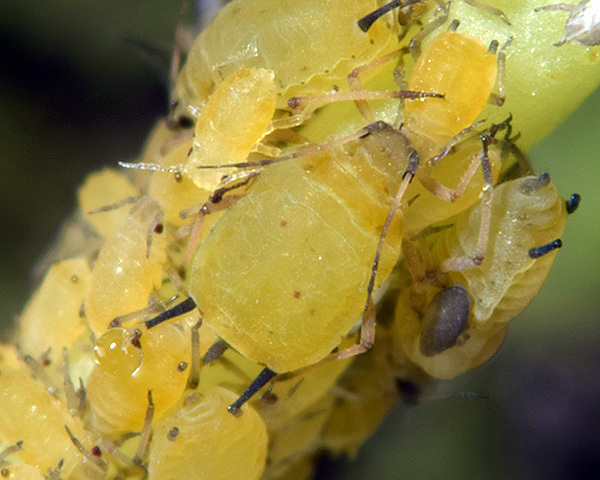 Apterae of Aphis hypochoeridis are bright yellow to pale greenish yellow (see first picture below). The antennal terminal process is 1.5-2.7 times the length of the base of antennal segment VI. The abdominal dorsum is entirely pale or with dusky bands across tergites 7-8 only. The siphunculi are dark. They are 3.5-7.1 times their midlength diameters, and 0.9 to 1.6 times the length of the elongated pale or dusky finger-shaped cauda. 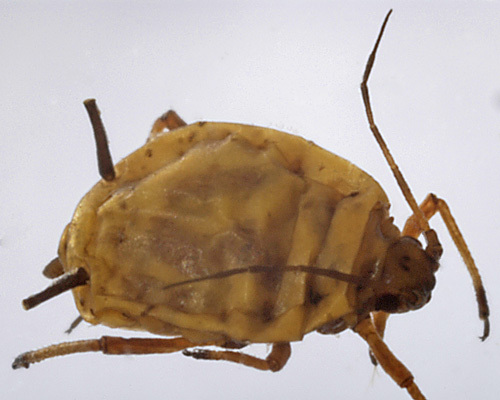 The body length of Aphis hypochoeridis is 0.7-1.6 mm. The Aphis hypochoeridis alate (see second picture above) has marginal and postsiphuncular sclerites, dusky bands on tergites 7-8, and median sclerites on some or all of tergites 1-6. They have 5-8 secondary rhinaria on antennal segment III and 0-4 on antennal segment IV. 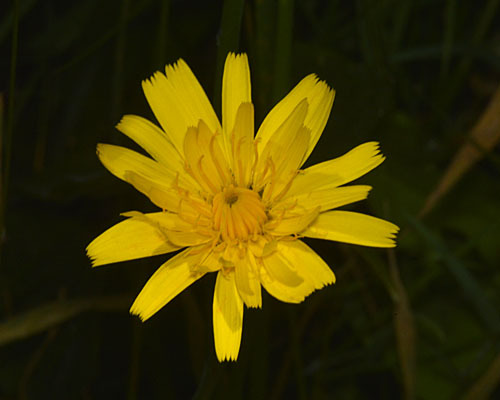 The cat's-ear root aphid lives on the root collar, the underside of radical leaves and up the lower part of the stem of Hypochaeris radicata (Cat's Ear). 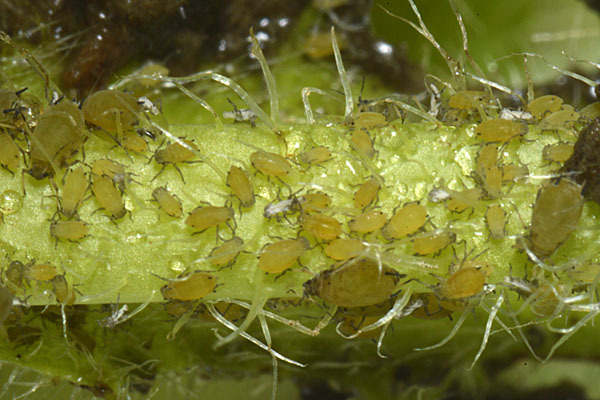 Aphis hypochoeridis do not host alternate. They have a sexual stage in the life cycle with oviparae and males appearing in autumn. They are usually 'tented over' (with earth) by Myrmica or Lasius ants (see below). 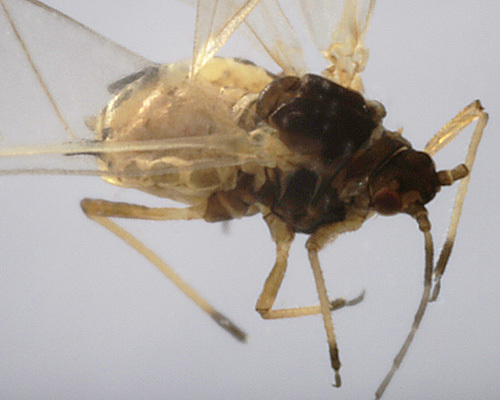 Aphis hypochoeridis is widely distributed in Britain and throughout Europe. Aphis hypochoeridis one of the easiest root aphids to find since they are nearly always attended by ants. 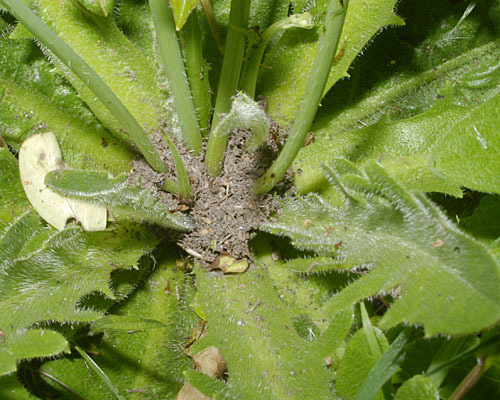 The ants 'tent over' the aphid colony, the basal root collar, and the stem of their foodplant (cat's ear, Hypochaeris radicata) with soil particles (see first picture below). In 2014 we found several colonies of Aphis hypochoeridis on cat's ear (the cat's ear flower is second picture above) growing on the grassy bank outside a neighbour's house. In this case the colonies were attended by Myrmica ants. 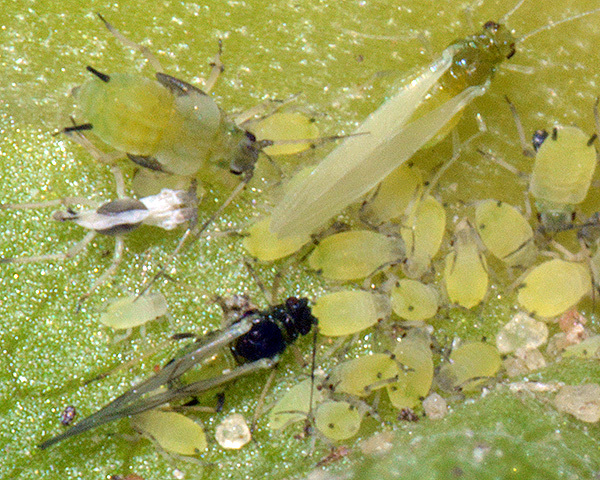 The picture above shows one of these attending the aphids on the plant's root-collar. 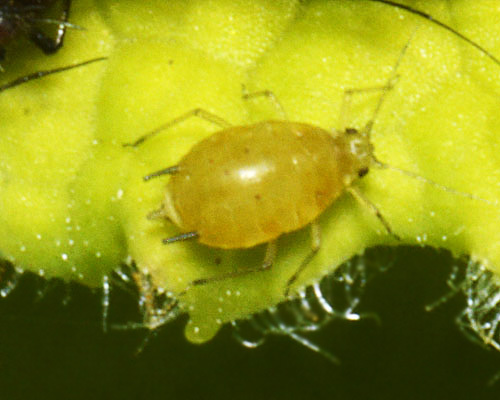 The aphids may have orange patches laterally and near the siphunculi. 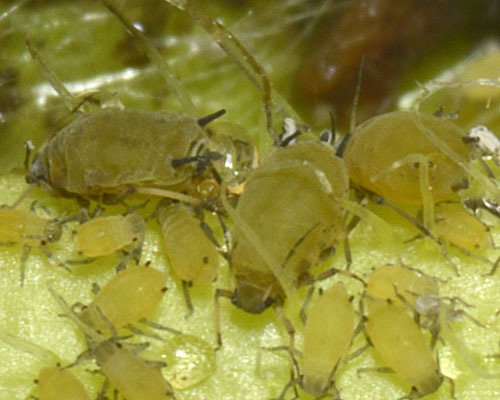 The nymphs tend to be more yellow than the more greenish apterae. The globules of liquid in several of the pictures above are aphid honeydew. 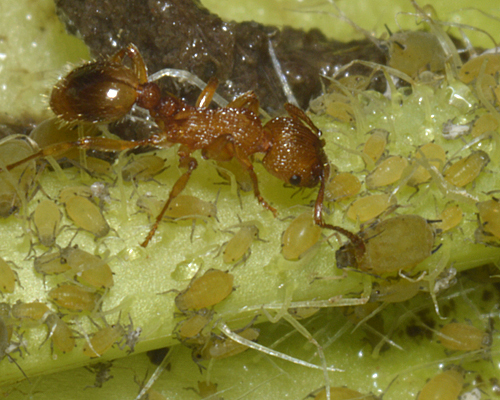 This sugar-rich liquid is excreted by the aphids and fed upon by the attending ants. The relationship between the ants and aphids is mutualistic - the ants get a rich energy source and the aphids gain protection from predators. Alates (see picture below) seem to occur rather more often than is usual for ant-attended root aphids, but they are still uncommon. 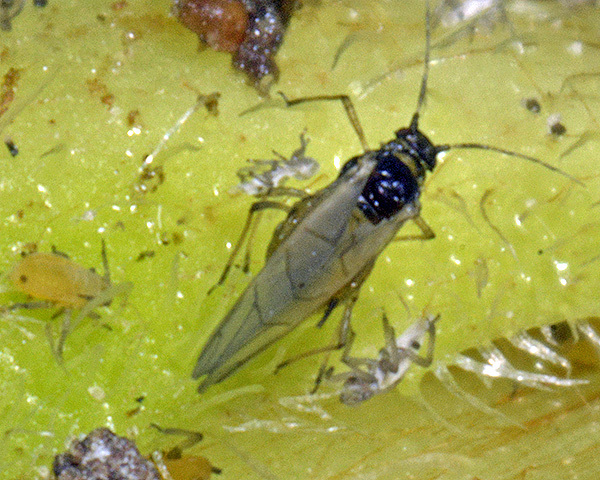 Aphis hypochoeridis has been recorded from 3 Hypochaeris species (Hypochaeris glabra, Hypochaeris maculata, Hypochaeris radicata). Blackman & Eastop list 24 species of aphid as feeding on cats ear (Hypochaeris radicata) worldwide, and provide formal identification keys. Of those aphid species, Baker (2015) lists 21 as occurring in Britain: Aphis fabae, Aphis gossypii, Aphis hypochoeridis, Aphis nasturtii, Aphis spiraecola, Aulacorthum palustre, Aulacorthum solani, Brachycaudus helichrysi, Macrosiphum euphorbiae, Myzus ascalonicus, Myzus cymbalariae, Myzus ornatus, Myzus persicae, Nasonovia ribisnigri, Neomyzus circumflexus, Protaphis picridicola, Trama caudata, Trama troglodytes, Uroleucon cichorii, Uroleucon hypochoeridis and Uroleucon sonchi.